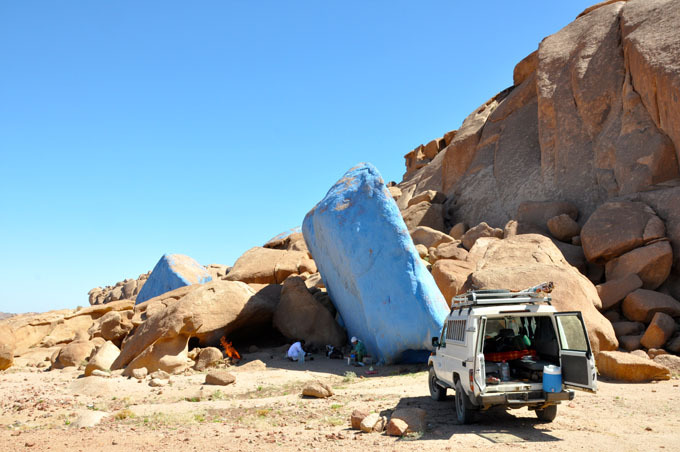 We will leave from Dahab in the early morning and drive directly to Saint Catherine. The monastery lies at around 1585 meters above sea level and is inhabited by approximately 30 monks. As the convent already closes at 11:30 am, an early start is necessary in order for us to have enough time for a convenient walking tour through the grounds and the ancient buildings. We would suggest two further possible tours that could be combined with the visit to the monastery. 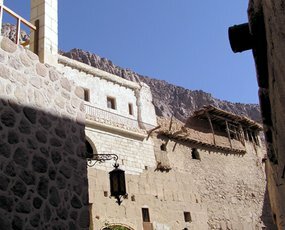 Saint Catherine’s Monastery is one of the oldest Christian convents still occupied. In the convent’s courtyard you will find the burning bush. According to the legend touching it will bring you luck. 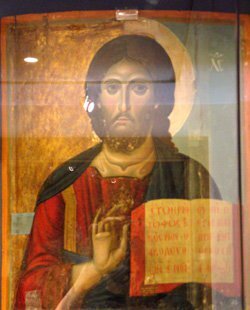 The convent contains many treasures, amongst others there are world-famous pieces of art and a collection of Byzantine icons. In exchange for an entrance fee of LE 25,- you can visit the exhibition of the icons. The entrance to the monastery is free. 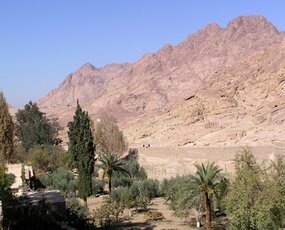 The first option after the visit to the monastery would be continuing on an easy hiking tour of around one hour to Wadi Arbain, the Wadi of the 40 martyrs. 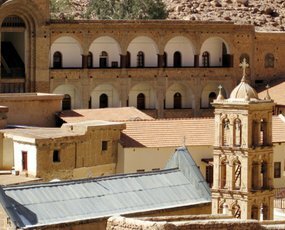 You will be fascinated by the amazing landscape around Saint Catherine’s Monastery, especially by its beautiful olive garden where the monks come to pray only on the most important religious festivals. 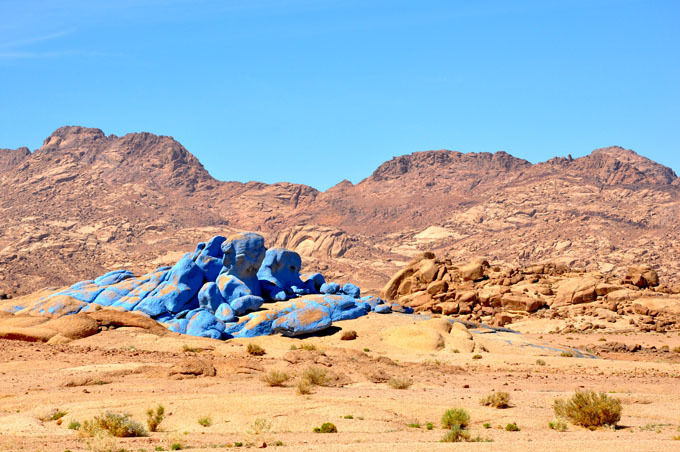 Free your spirit and just relax in a place where it seems that time stands still..
Another option after the trip to Saint Catherine’s Monastery would be visiting the Blue Valley, where in 1980 Belgian artist Jean Vera painted the rocks blue in this 15 square kilometers wide valley. 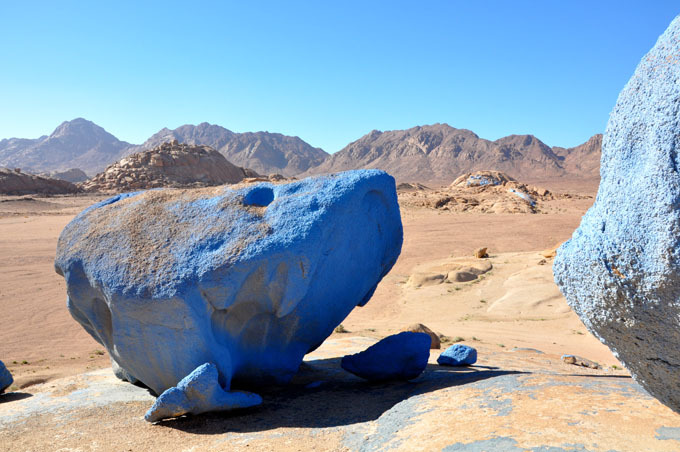 Of course with the approval of former president Sadat, as blue is the color of peace! We will then be enjoying the great view over the valley as well as a little snack in the shades of one of the many blue rocks. After that there will be enough time to walk around the blue mountains.